When I was just a little girl, I used to collect acorns by the boxfull as they fell in the fall. I didn’t know why. They just felt nice in the hand and somehow a big bunch of them felt satisfying. Could that be because somewhere in my ancestors’ time, acorns were a very important food? Native Americans all across oak-growing North and South America harvested acorns, which were nearly as important a food as corn or beans. Such tribes as the Cherokee, Apache, Pima, and Ojibwa routinely harvested and used the acorn. These Indian gatherers taught early settlers how to harvest and use acorns in their cooking, as they did corn and other traditional foods. Even today, many Indians gather acorns, both to use themselves and to sell in Mexican markets. And those bright, shining round acorns are very good for you, besides tasting great. Acorns have been tested and found to be possibly the best food for effectively controlling blood sugar levels. They have a low sugar content, but leave a sweetish aftertaste, making them very good in stews, as well as in breads of all types. Ground, leached acorn meal, ready to dry. The bitterness is gone. They are rich in complex carbohydrates, minerals, and vitamins while they are lower in fat than most other nuts. They are also a good source of fiber. An additional benefit from eating acorns is in the gathering. Acorns, although they “fall from trees,” must be picked and processed before eating, which requires a walk, then bending and picking up. All of these are good exercise. In fact, that is why many “primitive” foods are so healthy. They require exercise just to put them on the table, not just a short trip to the convenience store or fast food joint. One of the first things I learned as a little girl harvesting acorns was that they tasted awful. Unfortunately, many acorns do taste bitter. This is because they contain tannin, a bitter substance in oaks which is used to tan leather. Real pucker power here. Some varieties of acorns contain more tannin than others. They range from the Emory oak of the southwestern United States and northern Mexico, which is so mild it can be used without processing, to some black oaks with very bitter acorns, requiring lengthy processing to render edible. Generally, the best acorns to harvest are those of the white oaks, such as the swamp oak, Oregon white oak, and burr oak, as they contain less bitter tannin. Luckily, nearly all acorns can be made usable with natural processing which renders them nutty and sweet. Acorns are one grain that literally grows on trees. Even a small oak tree can produce a bushel or more of tasty, nutritious acorns. And that grandaddy oak out in the pasture could produce nearly a thousand pounds. Now that is a lot of eating from a small area. There are now several varieties of grafted oak trees, which bear nearly double the harvest of wild trees. These trees are available for purchase from specialty nursery companies. Not only are acorns great food for us, but for many birds and animals as well. Any deer hunter can tell you that one of the best spots to ambush a wily buck is on a trail to a big oak tree. Deer and wild turkeys harvest these nutritious acorns to fatten up for winter. Early settlers must have noticed this, as they soon began to turn their hogs out into the oak woods to fatten on the bounty of acorns. I accidently had this happen to two of my own pigs. I had a litter of weaner pigs, six in number in an outside pen. While we were in town, a stray dog came by and had great fun, chasing the little porkers around the pen. None were injured, but two of them vaulted the pen wall next to the shed and took off for the woods as fast as their little legs would run. We hunted, called, and scoured the woods for days. Weeks. No piggies. By then, we figured a black bear, which were numerous in our woods, had a midnight snack of pork on the hoof. Then one November, I was riding my horse down one of the wooded trails through huge old oaks, when I noticed turned-up fresh soil. Bear? Nope, my “bear” had left pig tracks. I tied my horse and scouted further, discovering seemingly acres of ground dug up underneath those bounteous oak trees. My lost piggies were found. But those tracks looked pretty big. To make a long story short, we corralled those errant porkers and hauled them home. On putting them in the pen next to their brothers and sisters, we were shocked. Out in the woods, they really looked big, but now they looked huge. They were a third again as big. On butchering, the woods raised hogs weighed 290 pounds, while the grain fed hogs barely made 200 dressed. So much for “modern feeding.” Of course the pigs had access to roots, grasses, insects, and more. But I credit much of their hearty size to those fat acorns they were gorging themselves upon. As acorns hold a long time under the tree, the hogs were feasting on last year’s crop all summer, then the fresh crop come fall. Not a bad natural feed. First of all, you’ll have to check out your local oaks during the spring when the leaves and underbrush are not as dense. Get a little pocket tree book and try to identify the oaks you find. In many areas, there are several varieties of oaks available to the acorn harvester. Some are quite mild and sweet and others pretty darned bitter. If you have a choice, try to find a variety with mild meat and only a little initial tang of tannin. You may have to simply nibble and check, come fall. Different varieties of oak have different shaped acorns. Crack a nice fat acorn with no worm hole. Examine the meat. It should be yellowish, not black and dusty (insects). Now, simply nibble and chew up a part of the nut. If it is very bitter, spit it out and try another kind of acorn. When you find a grove of relatively mild acorns, note this for next year and harvest away. As the understory is usually very thin below a decent sized oak tree, the acorns are quite easy to pick up. Depending on the variety of oak, your acorns will drop between late September and October, more or less, depending on your climate zone. The best way I’ve found to pick up acorns is to simply pick a nice dry, sunny day as soon as the acorns begin to drop and take baskets and sacks to the woods and sit down and pick them up. If you wait too long, the handy dandy squirrels and other wild critters will beat you to them, leaving only the worm-riddled hulls behind. The term “processing” brings to mind machines and chemical additives. With acorns, processing simply means making them ready to eat. When I get home with my bounteous haul, I spread them out a layer thick on an old sheet which I have laid on a roof, corner of the yard, or some other out-of-the-way dry, sunny place. This lets them sun dry and prevents any possible molding before I get them shelled. It will also kill any insect eggs or larvae, which might be inside. If you cannot lay the acorns out in the sun, spread them in a single layer on cookie sheets in a very slow oven for an hour. Some acorns, such as those of the Emory oak, require no more processing than cracking them open and eating them. Like most nuts, acorns of all types benefit from toasting on a cookie sheet in an oven at 175° F. Stir to prevent scorching. However, most acorns do contain enough tannin to make leaching this bitter substance out necessary. To do this, simply sit down and crack a big bowlful of acorns, carefully examining each nut for black holes, which indicates a worm is inside rather than a wholesome plump yellowish-beige nut. Acorns are very easy to crack. The shell is pliable and quite thin. Pop the cap off, then simply grasp it with a pair of pliers and give a squeeze. Don’t mash the kernel. Simply crack the shell. Then peel it off and toss the kernel into a bowl. When all are done, get out your food grinder. Put a fine knife on the grinder and run the shelled acorns through it. This makes a coarse meal. Place this in a large crock or glass bowl. Then add boiling water to cover and let stand an hour. Drain and throw away the brownish, unappetizing water. Repeat. Then taste the meal. It should have a bit of a bitter tang, then taste sweet as you chew a piece. Continue leaching out the tannin as long as necessary. When the acorn meal is mild tasting, it is ready to dry. I usually lay out a piece of old white sheet in a basket and pour the wet meal on it. Then, gathering up the edges, jelly bag style, I press and squeeze, getting out as much of the water (and tannin) as possible. One caution—don’t let wet acorn meal lie about for hours, or it will surely mold. Keep at the leaching process. Spread the damp meal out in a shallow layer on a cookie sheet or on sheets of your dehydrator. Then begin to dry it. In the oven, you only need the pilot light or the very lowest oven setting. As it begins to dry, take your hands and very carefully crumble any chunks which hold moisture. Slowly your meal will begin to look quite good. When the meal is completely dry, run it through a fine setting on your grain mill. The traditional method was to use a stone (mano in the southwest) hand grinder to crush the meal on a large, flat stone (metate). It is now ready for use in your recipes. If you produced more meal than you need right now, you can store the meal in the freezer or refrigerator in an airtight bag or jar. The dry, ground meal will last a week or so, stored in an airtight jar on the shelf. But, because of the oil, the meal will begin to go rancid, as will whole wheat flour and homeground cornmeal. You can also grind your meal in a food processor or blender a little at a time. I smile, thinking of the vast difference between grinding acorns between stones and using a food mill. What would our ancestors think? Some Native Peoples called acorns “grain from the tree,” indicating the use they had for it as a grain in cakes, breads, and thickening for stews and soups. Today folks use “cream of this and that” soups for the same thing. I think processed acorns taste like a cross between hazelnuts and sunflower seeds, and I often include acorn meal in my multi-grain bread recipes. Adding half a cup of acorn meal to a two-loaf bread recipe and reducing the flour, as needed, works quite well. Because the acorn meal is a natural sweetener, I only use a bit of honey to feed the yeast while softening it, relying on the acorn meal to give sweetness to the bread. No complaints yet. As acorn meal is very dense, you will have to take care to get your bread to rise when adding it. One way to ensure this is to use hot liquid and beat in your flour, making a batter. Then cool so you can add the yeast and the rest of the ingredients. This helps release wheat gluten to let the bread rise, despite heavy ingredients. Indian bread was always very dense and heavy, as there was seldom, if ever, wheat or yeast added to the recipe. It takes wheat gluten, as well as yeast, to make bread rise properly. Indian breads were often small, thin cakes baked before the fire on large, reflecting rocks. They were not puffy, large loaves as we are accustomed to today. While camping some time, why not tuck your food grinder into your kitchen pack and try making some old-time Indian bread out of acorn meal. It really puts you in contact with past ways in a hurry. Here is an Apache recipe for acorn cakes. Mix the ingredients with enough warm water to make a moist, not sticky dough. Divide into 12 balls. Let rest, covered, for 10 minutes or so. With slightly moist hands, pat the balls down into thick tortilla-shaped breads. Bake on an ungreased cast iron griddle over campfire coals or on clean large rocks, propped up slightly before the coals. If using the stones, have them hot when you place the cakes on them. You’ll have to lightly peel an edge to peek and see if they are done. They will be slightly brown. Turn them over and bake on the other side, if necessary. These cakes were carried on journeys dry and eaten alone or with shredded meat. We cheat and add homemade butter, too. But then, we are spoiled. Let’s take a look at one of my mixed grain breads with acorn meal to see how it differs from the Indian cakes above. Pour boiling water over oats, cornmeal, and acorn meal. Set aside. Dissolve the yeast in lukewarm water. In a large mixing bowl, beat the hot oatmeal mixture with the rest of the ingredients, except for the yeast and butter, adding the flour a cup at a time until you get a medium batter. Cool to lukewarm. Then add the yeast. Mix well and add enough flour until you have a spongy dough that is not sticky. Knead, adding flour if necessary to keep from being sticky. Place in a greased bowl and grease the top of dough, then cover it with a moist, warm kitchen towel and set it in a warm place until it doubles in size. Punch down, knead several times, and let rise again. Shape into loaves and place in greased bread pans or on a greased cookie sheet. This also makes great rolls, so you can use a cake pan, making golf ball sized rolls. Cover and let rise again until almost double. Preheat the oven to 350° F and bake for about 35 minutes or until the tops are golden brown. Brush with butter and cool. You can also make this bread in camp, using smaller loaves and a reflector oven or forming ½ inch thick by 1 inch wide by 8 inch long sticks and twisting the dough around a green stick and gently baking over medium coals—never a fire. Here are a couple recipes for these uses of the acorn. When I say “acorn meal,” I mean ground, leached-till-mild acorn meal, not raw. Bring salted water to a boil and sprinkle the acorn meal into the boiling water, stirring briskly with a wire or twig whisk. Then add the cornmeal. Add just enough cornmeal to make a thick, bubbling batch in which a wood spoon will stand up fairly well. Place the saucepan in a larger container holding two inches or more of boiling water. (Use a double boiler, if you have one.) Simmer the mush until quite thick, about 45 minutes, stirring occasionally to keep it from lumping. Cornmeal and acorn mush is very good for breakfast on a cold morning. It can be served with sweetened milk and a dab of wild fruit jam or homemade butter. But it is also great as a main course lunch or dinner. You can also add salsa or bacon bits and grated cheese on top to get great variety. This mush is very filling and will stick to your ribs. I often make a double batch and pour the “extra” in a greased bread pan. When cooled in the fridge overnight, it becomes quite solid and can be sliced in half inch thick slices, dipped in flour and fried in oil, first one side, then turn and fry the other. Fried acorn and cornmeal mush is one of our absolutely favorite camp (or at-home) breakfasts. Serve it with butter, salt, and thick fruit jam or maple syrup. Of course, David likes his with catsup. You might want to try your hand at a “modern” type of pemmican. It doesn’t keep on the trail for months, but it is pretty good. Boil the lean stewing meat. When it is tender, drain and allow it to dry in a bowl. Grind all of the ingredients together in a meat grinder using a fine blade. Grind again, mixing finely, distributing the ingredients very well. Place in a covered dish and refrigerate overnight. (Or you can eat right away, but like many foods, the refrigerating allows the flavors to blend nicely.) You can serve this on any flatbread, such as a tortilla. It is best served warm, or you can reheat it in the pan in the oven like a meatloaf. Acorn meal can also be used in place of a good portion (or all) of the nuts in most desserts, from brownies to cookies. It does depend on the variety of acorn you have available and the taste after leaching. Some acorn meal never gets “nutty,” only mild, while the meal of other acorns, such as those of the Emory oak, are so sweet that you can eat them without leaching, or with very little leaching. You will have to experiment a bit here. But the end results are usually surprising. Oh gee! You say oak trees don’t grow where you live? Well, just because they aren’t “native” doesn’t mean you can’t plant some. No matter where I go, I always plant a big bunch of food producing trees, shrubs, and perennial plants. And a lot of them certainly aren’t native to the area. Of course, you can just plant acorns or buy seedling trees from a nursery. 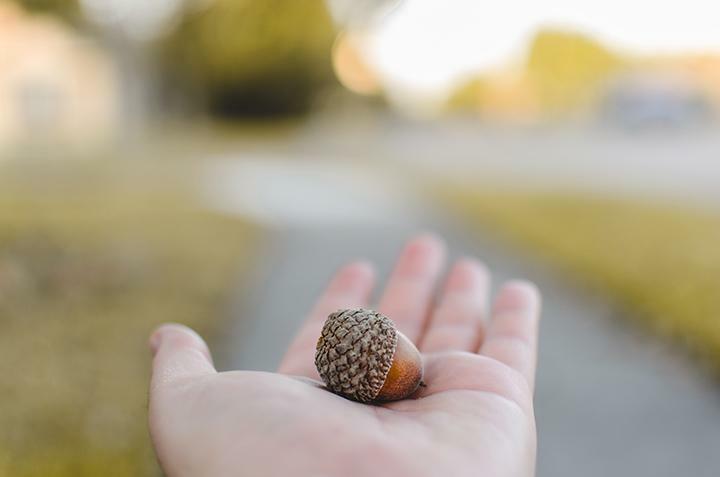 From an acorn or small seedling, you can usually figure you’ll begin to get a decent amount of acorns in about 10 years. Want faster results? Several nurseries are carrying grafted oak varieties, meant for food production. And at least one nursery has a very good hybrid of the burr oak that produces mild acorns requiring no leaching. You can write to St Lawrence Nurseries, 325 State Hwy. 345, Potsdam, NY 13676 or find them online at www.sln.potsdam.ny.us. They have a free catalog which includes many very hardy fruits and nuts. Oaks don’t grow where we will be moving, but you can darned betcha I’ll be planting them so I can enjoy those fabulous acorns. Until then, I’ll just have to drive down to my son Bill’s place near Oak Lake and pick a few baskets so we can enjoy all those good acorn recipes.